How Old is My Kit-Cat? 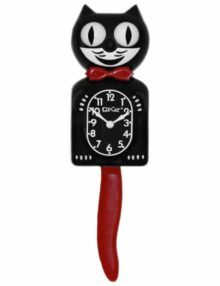 Classic Gentlemen Clocks Classic Black Kit-Cat is simply the original. Limited Edition colors are only made for a small period of time – once we sell out they become collector’s editions and often increase in value. NEW! Brighten up your room and life with Kit-Cat! Please read the full description below. The Classic Black Kit-Cat clock is our #1 selling clock and is made in America! Expose him to daylight (direct sunlight not necessary) and the glow will appear when the lights go out. Please select “build your own” first. 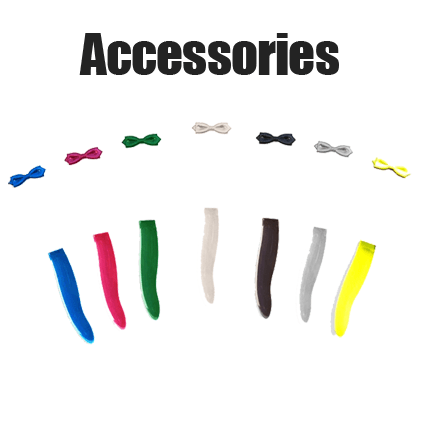 Do NOT “add to cart” until after you have customized your order. These clocks are custom made on demand, use the our website's clock builder to mix and match any colors you want! Digital design backgrounds are purely for fun – they are not a physical product or included in the order. Welcome to the Exotic Pet Collection! This Bengal Tiger Kit-Cat is ready for adoption. Bring him home today to share some school spirit, your love of animals, or a little walk on the wild side with Kit-Cat! Read more below about the special markings on these clocks. Welcome to the Exotic Pet Collection! This Butterfly Kit-Cat is ready for adoption. Bring him home today to be “elevated” by his smile and colorful print! Read more below about the special markings on these clocks. Welcome to the Exotic Pet Collection! This Cheetah Kit-Cat is ready for adoption. Bring him home today for a little walk on the wild side with Kit-Cat! Read more below about the special markings on these clocks. Welcome to the Exotic Pet Collection! This Giraffe Kit-Cat is ready for adoption. “Stick your neck out” and bring him home! Read more below about the special markings on these clocks. Welcome to the Exotic Pet Collection! This Patriot Kit-Cat is ready for adoption. His pattern will show off your love for America and support of American-made products! Read more below about the special markings on these clocks. Welcome to the Exotic Pet Collection! This Leopard Kit-Cat is ready for adoption. Bring him home today to share some school spirit, your love of animals, or a little walk on the wild side with Kit-Cat! Read more below about the special markings on these clocks. Welcome to the Exotic Pet Collection! This Carbon Silver Kit-Cat is ready for adoption. His pattern conveys strength and elegance! Read more below about the special markings on these clocks. 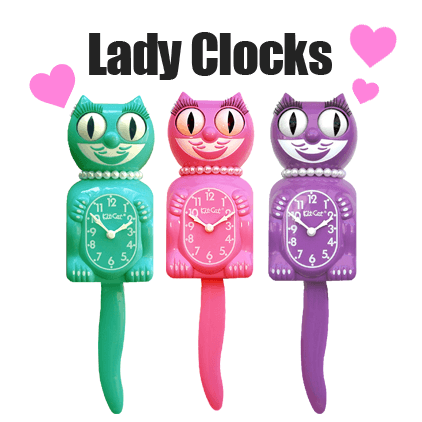 © 2019 California Clock Company Kit-Cat Klock® is registered trademark of the California Clock Company.